The 2018 Toyota Owners 400 was a Monster Energy NASCAR Cup Series race held on April 21, 2018, at Richmond Raceway in Richmond, Virginia. Contested over 402 laps -- extended from 400 laps due to an overtime finish, on the 0.75 mile (1.2 km) asphalt short track, it was the ninth race of the 2018 Monster Energy NASCAR Cup Series season. 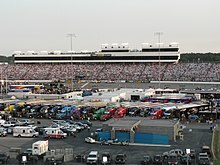 Richmond Raceway, the track where the race was held. Richmond Raceway is a 3/4-mile (1.2 km), D-shaped, asphalt race track located just outside Richmond, Virginia in Henrico County. It hosts the Monster Energy NASCAR Cup Series and Xfinity Series. Known as "America's premier short track", it formerly hosted a NASCAR Camping World Truck Series race, an IndyCar Series race, and two USAC sprint car races. Chase Elliott was the fastest in the first practice session with a time of 22.254 seconds and a speed of 121.327 mph (195.257 km/h). Kyle Larson was the fastest in the final practice session with a time of 22.441 seconds and a speed of 120.315 mph (193.628 km/h). Martin Truex Jr. scored the pole for the race with a time of 21.799 and a speed of 123.859 mph (199.332 km/h). The race resumed on lap 102, There were two lead changes at the start of the seocnd stage, Joey Logano, who won this race one year ago before being hit with a major penalty that prevented him from using the victory to qualify for the 2017 playoffs, won the second stage after also taking the first. Both stages went caution free. Following Logano, were three Stewart-Haas Racing drivers: Clint Bowyer, Aric Almirola and Kurt Busch. William Byron was fifth, Kyle Busch sixth and Ryan Newman seventh. Brad Keselowski, Martin Truex Jr. and Kevin Harvick rounded out the top 10, and caution flew for the second time for conclusion of the second stage. Back to green on lap 213, Other than cautions for the stage breaks, the yellow flagged remained out of sight through 350 of 400 laps. Caution flew for the third time when Ricky Stenhouse Jr. made contact with Ryan Blaney and collected Cole Whitt in turn 4. Brad Keselowski made a narrow escape, squeezing past and nearly grazing the inside wall that borders pit road. The race resumed on lap 362, and caution #4 flew seven laps later for contact between Kurt Busch and Jamie McMurray in turn two caused Ryan Newman to run into the back of McMurray coming off of turn two, which ended up causing Newman’s car to start smoking, McMurray was able to make repairs on pit road and remain in the race, one lap down. 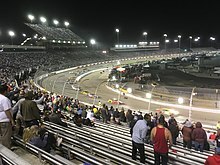 Back to green on lap 379 and the fifth caution of the race flew when avid Ragan spun in turn three, and Kyle Larson won the free pass under the caution. The race went back under green on lap 398 and the sixth caution of the race flew for debris in turn 3 after Ricky Stenhouse Jr. spun in the wall, sending the race into overtime. The race resumed on lap 400 for a two-lap NASCAR Overtime, Kyle Busch, who started from the 32nd spot, worked his way to the front early on and went on to win his third consecutive race. "All these guys on this M&Ms Camry team do a great job for me. I can't say enough about Adam Stevens and my guys on the pit crew tonight. They won this race for us," Busch said. "They got us off pit road first those last two times that we came down for tires and got us to where we needed to be." “It’s definitely cool we’ve won three in a row. We did it a couple years ago and now I don’t know if you can shoot for four in a row," he said. "It’s hard to go to Talladega with that much of a winning streak and think that you can go to victory lane, but we’re going to go there anyway and give it a shot. . . . Our guys are amazing. They’re awesome every week and I love racing with these guys and Joe Gibbs Racing." Fox Sports covered their 18th race at the Richmond Raceway. Mike Joy, two-time Richmond winner Jeff Gordon and six-time Richmond winner Darrell Waltrip had the call in the booth for the race. Regan Smith, Vince Welch and Matt Yocum handled the pit road duties for the television side. MRN had the radio call for the race which was also simulcast on Sirius XM NASCAR Radio. Joe Moore, Jeff Striegle and six-time Richmond winner Rusty Wallace called the race in the booth when the field raced down the frontstretch. Mike Bagley called the race from a platform inside the backstretch when the field raced down the backstretch. Winston Kelley, Alex Hayden and Glenn Jarrett worked pit road for the radio side. ^ "2018 schedule". Jayski.com. Jayski's Silly Season Site. May 5, 2017. Retrieved March 12, 2018. ^ "Richmond International Raceway". NASCAR.com. NASCAR Media Group, LLC. January 3, 2013. Retrieved March 12, 2018. ^ "Entry List". MRN.com. Motor Racing Network. April 17, 2018. Retrieved April 17, 2018. ^ "First Practice Results". MRN.com. Motor Racing Network. April 20, 2018. Retrieved April 20, 2018. ^ "Final Practice Results". MRN.com. Motor Racing Network. April 20, 2018. Retrieved April 20, 2018. ^ "Qualifying Results". MRN.com. Motor Racing Network. April 20, 2018. Retrieved April 20, 2018. ^ "Toyota Owners 400 Results". MRN.com. Motor Racing Network. April 21, 2018. Retrieved April 21, 2018. ^ "Points standings" (PDF). Jayski.com. Jayski's Silly Season Site. April 23, 2018. Retrieved April 23, 2018. ^ "Manufacturer standings" (PDF). Jayski.com. Jayski's Silly Season Site. April 23, 2018. Retrieved April 23, 2018. ^ "Richmond TV Ratings". Jayski's Silly Season Site. ESPN. Retrieved 7 May 2018. ^ Utter, Jim (April 20, 2018). "Chase Elliott leads first Cup practice at Richmond". Motorsport.com. Richmond, Virginia: Motorsport Network. Retrieved April 20, 2018. ^ Utter, Jim (April 20, 2018). "Kyle Larson tops final Cup practice at Richmond". Motorsport.com. Richmond, Virginia: Motorsport Network. Retrieved April 20, 2018. ^ Kurz Jr., Hank (April 20, 2018). "Truex claims pole at Richmond; third of the season". Associated Press. Richmond, Virginia: AP Sports. Associated Press. Retrieved April 20, 2018. ^ a b c Cite error: The named reference The NASCAR Toyota Owners 400 at Richmond as it happened was invoked but never defined (see the help page).